If you're looking for ways to spruce up a salad, try different vinaigrette's. Even with the same greens and vegetables, you can dramatically change the flavor, texture and appearance of a salad with a different salad dressing. In this recipe video, I show you how to make a roasted tomato vinaigrette. This tomato vinaigrette is great in late summer and early fall when the tomatoes are at their peak. By slow roasting the tomatoes in the oven you concentrate their flavor and get a great sweetness out of them. The sweetness in the tomato goes great with the tangy vinegar. The best part is this roasted tomato vinaigrette goes great with so many things. In addition to using it as a salad dressing (last time I made it I dressed a asparagus salad), this vinaigrette makes a great sauce for fish and chicken dishes. This roasted tomato vinaigrette is fairly simply to make. To make sure it’s the best it can be, it helps to use fresh, good quality tomatoes. More than anything else, especially in simple vegetable dishes like this, the quality of your ingredients determines the quality of the finished product. 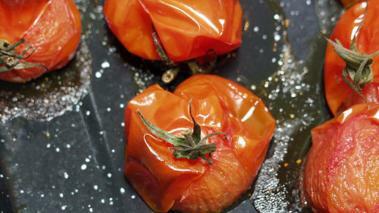 You also want to make sure you thoroughly roast the tomatoes and really evaporate most of the water out of them. It’s hard to overcook them, so don’t be shy about letting them go for a while. The final key to success I want you to be aware of, is to make sure the vinaigrette stays balanced. Each component plays a role, and you want them to work in harmony. Too much vinegar, or not enough, could make the vinaigrette taste either too harsh or too flat. I give you measurements below, but really you need to taste and make adjustments as you go. In this video I make a broken vinaigrette. To do so, combine a tablespoon of the tomato mixture with 2 – 3 tablespoons (obviously you can make more, just use this ratio of tomato to oil) of good olive oil and gently stir together. The tomato and oil will not fully combine but stay separated – thus the “broken” name. You can then use as is, and the effect makes a pretty cool pattern on the plate. If you don’t want your roasted tomato vinaigrette broken, after blending the tomato mixture, slowly add olive oil directly to the blender (while it’s running) to make an emulsified dressing. Go by taste to determine how much oil, but my general rule of them is to use 2 – 3 times the amount of olive oil, that I have tomato mixture. This salad dressing is great, hope you enjoy it, and let me know how it goes.